Be in total control of your customer relationships with a CRM system built from the ground up specifically for Printers / Printing Industry Business. Customize your new printing website however you want. Marketing your printing business has never been easier, included is e-blasting software with reporting. Automate your invoicing with automatic invoices generated when customers place orders. Quotes are submitted directly through the website by customers and easily converted into orders by your staff from the CRM. A built-in Content Management System right into your printing website. Update anything on your website with ease. 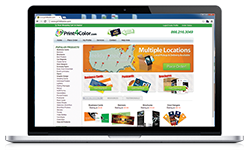 Sell your printing online, over the phone or in person with the POS system in the software. Complete management of your infomation all from within one system. All of our Software Packages include a built-in CRM. We have software packages suited for every type of business in the printing industry. More than just a CRM, get all of the following features with the software. What Makes this CRM Unique for Printers? Customer relationship management is a tool that is mostly used by many businesses to manage customer information. It is used to manage contacts, keep email records or as a point of connection. CRM is very important for your print business in a variety of ways and it is majorly used by many printing companies. Through the CRM software you can easily put all the information about the customers in one database and this makes it easy for retrieval and management of the information. Customer relationship management software is essential for a printing business since your business will be in a position to enjoy several benefits. You can also get to know the buying behavior and presences of the customers by gathering such information hence help you make more informed decisions and help you promote your print products online. CRM for printers helps many printing companies to get access to the leading technologies in the market at reasonable costs. Our CRM for printers is widely used by successful printing companies and offers customers with marketing orientation at the same time encouraging product loyalty. With printing in a box software web to print ecommerce, you can conduct your sales online since this feature is more ideal for printers. Apart from the inbuilt customer management software in printing in a box, there are other several features that you will enjoy through printing in a box for instance workflow management, total supply chain aand analytics and reporting. Get Started Today, Signup Here! Save money, time and stay in contact with your customers with our CRM software.